Thank you for this one, it sure is beautiful. Keep the designs coming, you are one talented lady. That's pretty cool. Are you going to share it with the Ravelry Dishcloth Designers? I just noticed your "cowboy dishcloth" & was totally amazed. How talented you are. OMG! Thanks soo much for sharing your talent. FANTASTIC! 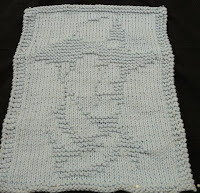 I have been asked to donate a horseshoe dishcloth for a riding club's annual fund raiser. Your dishcloth will really this a hit. I can't wait to start this and make it for them. Your talent and eye for detail is awesome. I really appreciate your abilities. Thanks so much!! Yee Haw! !